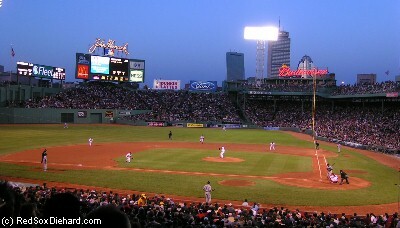 The day after my last game the Red Sox faced the Yankees for the first time since that fateful Game 7 last October. The Red Sox won both Friday's and Saturday's games. It was particularly satisfying that Tim Wakefield got the win Friday, because he had thrown the final pitch of the season to Aaron Boone last season. Even though he took the loss in that game, he wasn't to blame (he had won both his starts in the ALCS to help get to Game 7) and had wondered aloud if he'd be remembered like Bill Buckner. The answer was "of course not", but I had made sure to give him an extra loud cheer on Opening Day, so he would know how the fans felt about his nine-year career with the Red Sox. (I also noted that the Sox had gotten and held onto a 5-2 lead in both games this weekend, a feat that had eluded them last October.) On Sunday, Derek Lowe would be starting for the first time in ten days, since his start had been skipped during the week due to a rainout. I arrived early to the game, and walked around to Gate B before going in. A new statue of Ted Williams with a Jimmy Fund patient had just been unveiled, and I wanted to take a picture. I went in Gate B, to the new Big Concourse area, where if you look up you can see the scoreboard over the center field bleachers. It said, "Welcome to On-Field Photo Day." I hadn't heard about any promotions today, and wondered what that meant. I thought they were doing their team photos on the field, and we'd be able to watch from the stands. When I got to my seat, I realized fans were allowed to walk on the field. I guessed it must mean that we could take our photos on the field today. My friend and I rushed down the ramp in center field which goes past the batting cages and out to the field. When we got there, I was surprised to see Scott Williamson right in front of me. "Do you want to take a picture?" he asked, and I posed with him while my friend took the picture. So On-Field Photo Day was a lot like the Meet-and-Greet night they had had a few years ago, but with a lot more space to walk around! 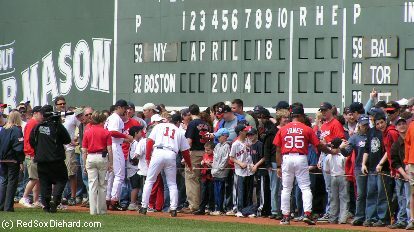 Fans could walk around the warning track, while players circled past, shaking hands and posing for pictures. 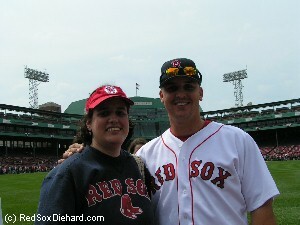 I posed for another photo with Keith Foulke when he walked by. He had been excellent so far this year, and he was just what the doctor had ordered for the bullpen. We got to see and shake hands with Terry Francona, Mike Timlin, Mark Bellhorn, Gabe Kapler, Pokey Reese, Johnny Damon, and Cesar Crespo. When Wakefield walked by, I made sure to ask to pose with him, again wanting him to know we didn't blame him for what happened last year. As I shook Ellis Burks' hand I told him, "It's good to have you back in Boston." He had started his career here in 1987, but he had been plagued by injuries. He had gone on to hit over 300 home runs in his major league career, and this was probably his final season. We then spotted Jason Varitek, my friend's favorite player, on the third base side. We rushed over, and she was able to get her picture taken with him. 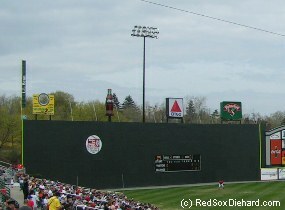 On the way back, we peeked inside the Green Monster, and I even scooped up a handful of real Fenway warning-track dirt! Unfortunately the game did not even come close to matching the fun of our pre-game stroll around the field. The Sox scored a run in the first, but Lowe was rusty after the long layoff and let the Yankees tie it up in the second. Then he got knocked around in the third, as New York scored six runs. The Sox got two more off Jose Contreras in the bottom of the inning, but never got back into it. No more runs crossed the plate after the third inning, as both teams' bullpens pitched well. The Red Sox would go on to win their Patriot's Day matinee against the Yankees the next day, so it ended up being a successful weekend as they took three out of four. I was just sick of always seeing the one game they lose! After taking three of four from the Yankees at Fenway, the Red Sox hit the road. They took two of three in Toronto, then swept the Yankees in New York. Pedro Martinez combined with Scott Williamson for a shutout in the finale. The series was made even sweeter for Red Sox fans because Derek Jeter was hitting below .200 for the season, and both he and A-Rod were getting booed at home by the Yankee Stadium crowd. After an off-day Monday, Tuesday's game was rained out. I was back on Wednesday, in a great seat in Section 24. When I chose this game before the season started, I counted by fives from Opening Day, aiming for a Pedro or Curt Schilling start. I picked one that figured to be Schilling, thinking that even if there was a rainout and everyone got moved up a day, I'd stil get Pedro. As it turned out, there had been three rainouts so far, and Tim Wakefield's spot had been moved around so that he was second now instead of Curt, but tonight's game still wound up being Schilling. I was excited to watch him after all the hype this off-season. Before the game started, the following announcement was posted on the message board: BEGINNING IN THE THIRD INNING, OUR USHERS WILL ASK FANS IN THE CONCOURSE TO ONLY RETURN TO THEIR SEATS BETWEEN BATTERS, AND NOT DURING PLAYERS' AT BATS. It was a great concept, because there are always rude people who sit through the whole break between innings, and then get up and down while the game's going on, without regard for those sitting around them. Unfortunately, the way Fenway is laid out, with entrances from the concourses in the middle of the stands instead of just the back, makes it impossible for ushers to be able to enforce this. But it was nice to know that they were at least willing to try. The Devil Rays had two singles in the first, but Curt fanned Tino Martinez to end the inning. Tino was booed lustily every time up, and struck out three times, to the delight of the crowd who had not forgotten that he used to play for the Yankees. The Devil Rays never had two baserunners in an inning after the first, as Schilling shut them down inning after inning. Jason Varitek's fourth-inning homer gave the Sox a 2-0 lead, but the funniest moment came in the bottom of the seventh. One run had already scored, when the Red Sox loaded the bases and Mark Bellhorn came to the plate. He was hitting .185 to start the season, but was leading the league in walks. Normally with the bases loaded, no matter how light a hitter is at the plate, people will cheer for a grand slam, or a big hit of some sort. But this time, a group of guys behind me started chanting, "Base on balls, base on balls!" When he swung and missed at strike one, they yelled, "Keep that bat on your shoulders! What are you doing swinging?" Much to our surprise, he smacked a single to left, knocking in two runs. We all agreed it might not be such a bad idea for him to swing! The Red Sox tacked on one more run in the eighth, and Alan Embree and Lenny DiNardo finished it off for the Sox' fourth straight win, and second straight shutout. The next day the Sox played a doubleheader with the Rays. The first game was a makeup of Tuesday's rainout, and was their third straight shutout. Derek Lowe gave up a couple of runs in the nightcap, but the bullpen extended their scoreless streak to over 32 innings. Both games were again sellouts, extending that streak, too. When I saw that a weekday afternoon game in April against the Devil Rays was a sellout (and all the seats were full; it wasn't one of the falsely-inflated sellouts that are often reported for makeup games) it was clear that they'd be able to sell out every game this year. 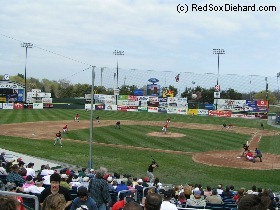 While the Red Sox were on the road, I took a trip to Portland, Maine, to see the Sea Dogs, the Red Sox' Double A affiliate. We had good seats near home plate, behind the backstop screen, as the Sea Dogs faced off against the Norwich Navigators, an affiliate of the San Fransisco Giants. I didn't recognize too many names in the line-up today, but I did remember second baseman Raul Nieves, who had played here last year. I had also heard of John Hattig (who was traded to the Toronto Blue Jays for reliever Terry Adams later in the season) and Jeff Bailey. Ryan Cameron was the starting pitcher, and he had a very unique wind-up. I've seen the Yankees' Mike Mussina make a kind of bow before throwing when he pitches from the stretch, but this was much stranger. 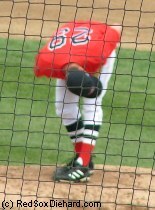 Cameron bent completely over, until we swore his chin was touching his knees - and he did this before every pitch! It seemed to work, though. He went 5 1/3 innings, giving up only one run on five hits and three walks. Meanwhile, Cameron's teammates gave him plenty of support. Jeff Bailey was the offensive star, belting a home run and a bases-loaded triple, and adding a single in the eighth. Mike O'Keefe also homered. Brett Roneberg had 3 RBI and Sean McGowan had 2. The Sea Dogs went on to beat the Navigators, 12-2.